Members and volunteers of Nashville’s Hillcrest United Methodist Church’s Sunny Day Club® enjoy a variety of activities each Wednesday. 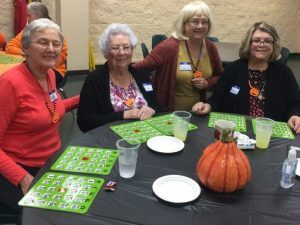 Money from a Golden Cross Foundation grant was used toward retrofitting the church’s 20-year-old Christian life center and fellowship hall in preparation for this ministry for persons in early stages of memory loss. Hillcrest United Methodist Church in Nashville, Tennessee, received a $10,000 grant from the Golden Cross Foundation, a non-profit corporation and extension ministry of the Tennessee Conference of The United Methodist Church. Money from this grant was used toward retrofitting the church’s 20-year-old Christian life center and fellowship hall in preparation for a new ministry for persons in early stages of memory loss. Called the Sunny Day Club®, the ministry’s mission is to provide respite for caregivers and a regular outing for club members to stimulate their minds, bodies, and spirits in a safe and familiar environment. During the program’s planning phase, church members identified retrofitting needed to make both spaces more accessible and welcoming. Restrooms used by the club members and volunteers needed grab bars to make them safer. In addition, the entrance to the Christian life center was small and offered limited protection from inclement weather. Money from the grant was used toward installing acoustical panels in the fellowship hall, grab bars in the restrooms, an awning over the outside entrance, and ramps and handrails. Last August, Hillcrest UMC welcomed three members—two from the congregation and one from the community—and 13 volunteers to its inaugural meeting.